I overheard a couple at a restaurant the other day talking about fish. “They’re all the same,” the woman said. “Just white and flaky and boring. There’s no taste to them, except for salmon. I love salmon.” The guy wasn’t saying much, just nodding his head in agreement while he stroked her hand on the table. Clearly his mind was not on fish. But I am older, and slightly wiser now. Still, the simple fact is that fish not only has flavor, it has even more diversity in taste, texture and color than terrestrial meats. Most people don’t pick up on this because they eat their fish breaded and fried. And while I love fried fish, there is more to life than beer batter. Really. Take this dish. 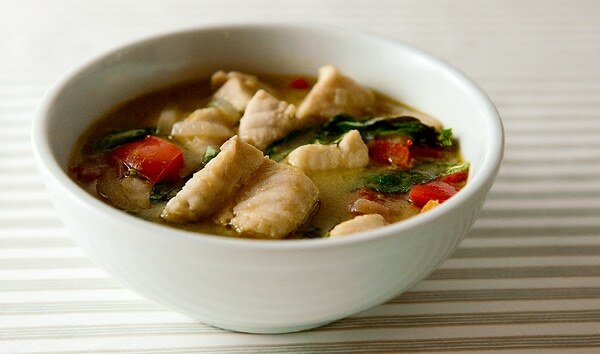 It is a pretty classic Thai green curry, a style that lends itself to fish. But not just any fish will work. Drop a salmon in there and you have a cross-cultural disaster. Mackerel? Same thing. Sole? Why not spread mayo on your truffles. No, Thai green curry requires a firm fish, and preferably a white fish. Firm fish will not dissolve in a curry or stew. And white fish, preferably a saltwater one, will add a pretty color contrast and a saline hit of umami to the complexity of the curry. What, exactly, do I mean by a firm fish? Halibut, shark (not an endangered one! 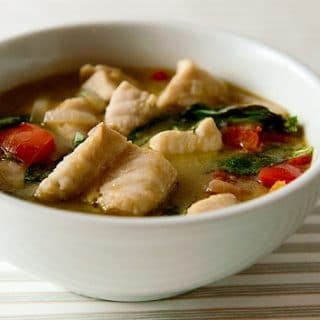 ), grouper, and other good candidates would be sturgeon, swordfish, red drum, cobia, tilefish, northern pike, California seabass or California sheepshead, albacore tuna — or what is perhaps the greatest soup-stew-curry fish in North America, the tautog. As for the curry itself, I did “cheat” a little for this recipe. A while back I made a venison curry, and I made the curry paste from scratch, with the best ingredients I could get. It was awesome, but I had to admit that it was not that much better than a curry made with a high-quality pre-made paste. I typically use Thai green curry paste made by Mae Ploy, but there are other good brands out there. I did doctor the curry paste up with a extra lemongrass and galangal, which is a rhizome a little like ginger. I also used Tabasco’s green jalapeno sauce, which is admittedly unusual. But fresh green chiles are not yet available at our farmer’s market, and the green hot sauce worked surprisingly well with the green curry. The result? Sour, salty, spicy and sweet. Restaurant worthy, and, dare I say, quick and easy — two words you don’t always see on this site. The exact species of fish is not important here, but it must be a firm fish. If you are in the East, seek out tautog, red drum or tilefish. If you are in the South, look for snapper, drum or cobia. 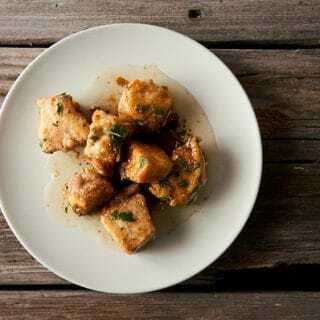 In the Midwest, use chunks of northern pike. In the Pacific, halibut, California seabass or sheepshead and albacore are all good choices. This curry comes together pretty quickly, so have everything cut and ready before you start. For the paste, if you have a good green curry recipe, go ahead and use it, but I just use Mae Ploy green curry paste. Most of the other ingredients are available in supermarkets, and if you can't find them, you can skip them. In a wok or a large saute pan, heat the peanut oil over high heat until it shimmers, then add the ginger, lemongrass, galangal and onion. Stir-fry for 1 minute. Mix in the curry paste, turn the heat down to medium-high and cook, stirring often, for about 5 minutes. Add the coconut milk and red pepper and bring to a gentle simmer. Add fish sauce, Tabasco and sugar to taste. Simmer for 5 minutes. Mix in the fish and simmer another 5 minutes. Right before serving, add the fresh herbs. Serve hot with rice. You can find more than 100 recipes for all sorts of fish here on Hunter Angler Gardener Cook! 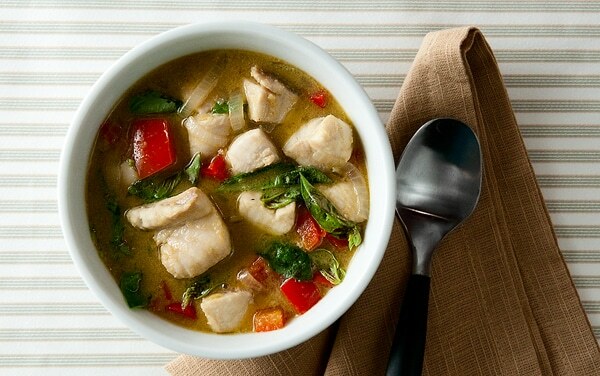 A good Thai curry is needed to shake off our deluging Northcoast winter right about now! I’m making a “seafood” version of this curry tonight for eight. Using my season’s unfortunately dwindling stash of Pacific halibut, some wild Gulf prawns (I buy a few frozen kilos of when I see a good deal) and a box CA squid. The same box of CA squid used to be so cheap (like $.50/lb) we used it for crab bait. It is still pretty reasonable if you buy it by the box… even if they call it calamari. Hey, another great fish for dishes where a firm texture is needed is Cabezon. It is also my favorite for a white fish ceviche (once frozen to required temp/time).